From Pinterest to Etsy, consumers are on the lookout for unique art to brighten up their homes — and their party menus. Many of these consumers take notice of true craftsmanship, and are willing to pay a little more for a job well done rather than take on the risk of a DIY project. The bakers and decorators behind three local artisan bakeries in Columbia are bringing these ideas to life in edible form with cookies, cupcakes and tiered cakes. The women behind these businesses share their stories, filled with joys and challenges they’ve encountered along their entrepreneurial journeys. Tammy Carter’s love of baking began to bud when she was just a child. That love, along with her baking skills, blossomed into a fruitful business a few decades later. 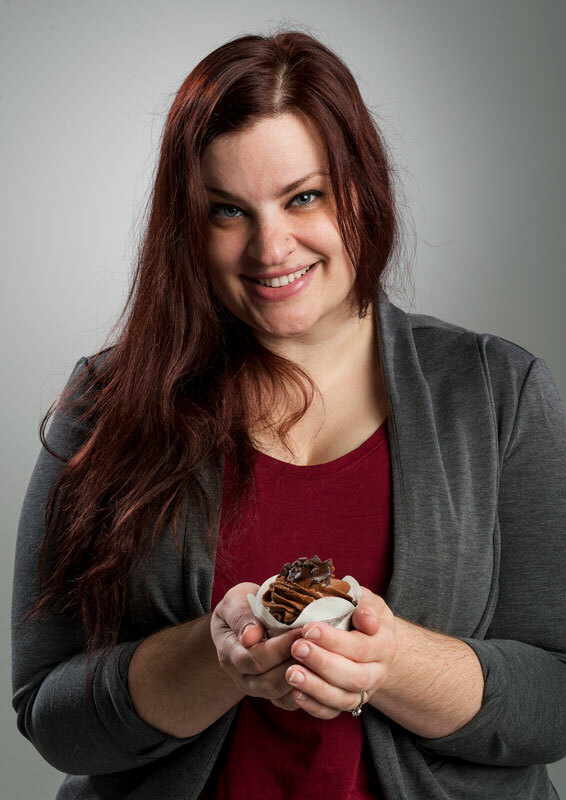 Over the past six years, at the helm of Fluffybutt Cookies, Carter has baked her professional dreams to life, one dozen cookies at a time. 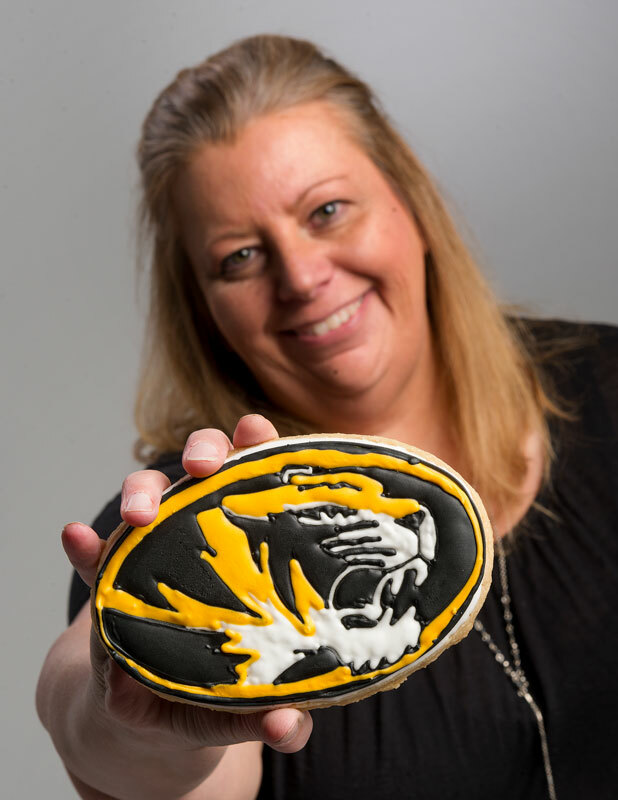 Fresh from her own kitchen, Carter opened Fluffybutt Cookies in 2011 under Missouri’s Cottage Law, baking and decorating custom orders right from home. Today, Fluffybutt Cookies is known for soft-baked sugar cookies marked by a whisper of citrus flavor in both the cookie itself and its icing. The flavor is palette pleasing, but it’s the designs that will first catch your attention. Fluffybutt Cookies began as a side venture for Carter, who maintained a full-time job, leaving the baking for nights and weekends. But by summer of 2017, her orders became large enough and frequent enough that she had to make a decision: take a leap of faith and go full-time baking, or quit baking and reclaim her free time. Carter decided to follow her dreams, and begin the process of opening a brick and mortar storefront for Fluffybutt Cookies. In late 2017 or early 2018, Fluffybutt Cookie Studio will open at 110 N. 10th Street, in the North Village Arts District. For Tammy, opening the shop here made perfect sense. “This is art, so it kind of lends itself to that area,” she says. Customers can choose from a variety of cookie package options; there are selections perfect for families, a girls night out, or even a corporate event. Carter aims to provide an opportunity to make memories in her studio. “Cookies are tastier than a picture you post on your fridge, and the kids will be super proud of them.” In addition to the studio, customers will also be able to place orders outside of Columbia. With her business able to utilize a commercial kitchen instead of her home kitchen, Carter will now be able to ship cookies nationwide, greatly expanding her market. To develop a plan for opening the storefront, Carter worked with the Women’s Business Center. During this time, her advisers urged her to consider changing the name of her business. “I took what they said to heart and thought okay, well I can see where they are coming from,” she says. “I totally understand that to some the name may, at first be offensive, not care for it, think it unprofessional, but the name holds meaning for me.” The name Fluffybutt Cookies is undoubtedly a conversation starter, and that’s exactly what it was meant it to be, she says. Natasha Myrick, owner of Mama T’s Cupcakes, has poured love into each batch of cakes she’s baked since her business opened three years ago. 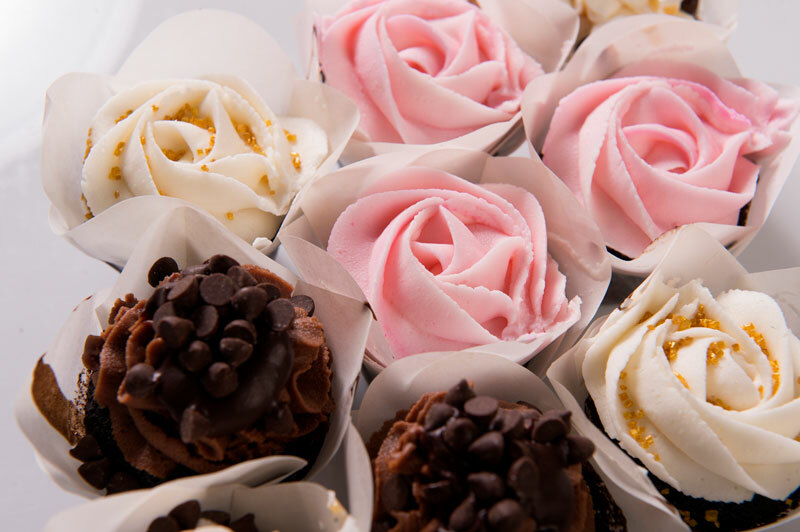 Operated under Missouri’s Cottage Law, Mama T’s Cupcakes bakes the tiny cakes by the dozen for custom orders. The business began to bloom after Myrick baked cupcakes for her own wedding; after guests got a taste, she said, they couldn’t get enough. From this humble start, Myrick’s business has grown into a bigger job than she fathomed. Recently, she’s been baking up to 25 dozen cakes a weekend, to be served at events and for purchase individually at Plume boutique in south Columbia. Mama T’s and Plume have been in a partnership for two years, with Myrick baking cupcakes on Wednesdays to be served in Plume Thursday through Saturday, and she also uses the commercial kitchen on weekends to bake for custom orders. Her menu, which rotates to incorporate seasonal ingredients and flavors, is a hit with Plume customers, who often grab a cake at the end of their shopping trip. Her personal favorite, and a favorite among customers, is the triple chocolate ganache. The chocolate cakes are filled with chocolate ganache and topped with a dark chocolate and Nutella icing. She also knows that in order for her customers to feel cared for, she must also take care of herself. And that’s why at the end of the summer, shortly before her new school year began, Myrick and the owner of Plume, Kelly Gilion, made the tough decision to have Mama T’s Cupcakes take a short hiatus from Plume. It wasn’t the lack of successful collaboation that pre-empted this recess, but rather the lack of space, and the opportunity for Myrick to pursue other career goals in the coming months. Plume’s vintage kitchen, which is adored by Myrick and the other makers at Plume, is complete with a 1950s stove, which only allows a dozen cupcakes to be baked at a time. This tight space has made it difficult to complete the large quantity of orders she’s had pouring in during the past few months. A trio of three Columbia artists has pooled their varying talents to form Columbia’s newest artisan bakery, the Painted Cake Co. The boutique confectionary creates whimsically painted cakes and cookies for weddings and other celebratory events. Its genesis came after Jessica White, a local artist and wedding photographer, felt the call to connect with a paintbrush after spending seven years behind a camera lens. “My mom’s an artist, she’s a painter, so drawing and painting has just been an innate ability for me,” she says. “That [ability] will just sit in you if you don’t do anything with it.” The ensuing idea that began to bud in her mind – painted pastries – seemed like the perfect merger of artistic expression nuptial novelty. To create the new business, she joined forces with Carly Love and Amity Mains, owners of CoMo Confectionary and Amity’s Cookie Shoppe, respectively. 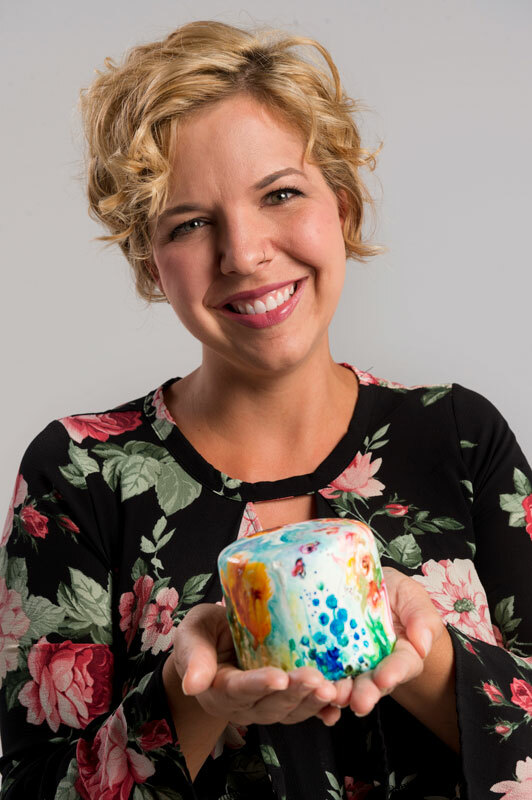 Since The Painted Cake Co.’s inception less than a year ago, painted cakes and cookies have made way to local weddings, baby showers, graduations and more. 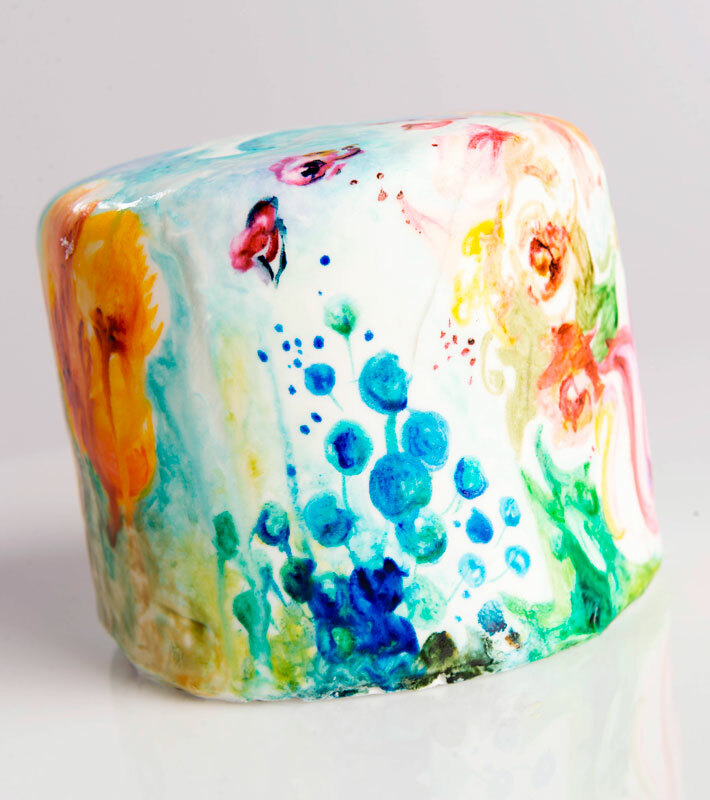 The cakes, which can be custom-ordered to size and flavor, are covered in white fondant and painted with food coloring, creating a soft watercolor effect. 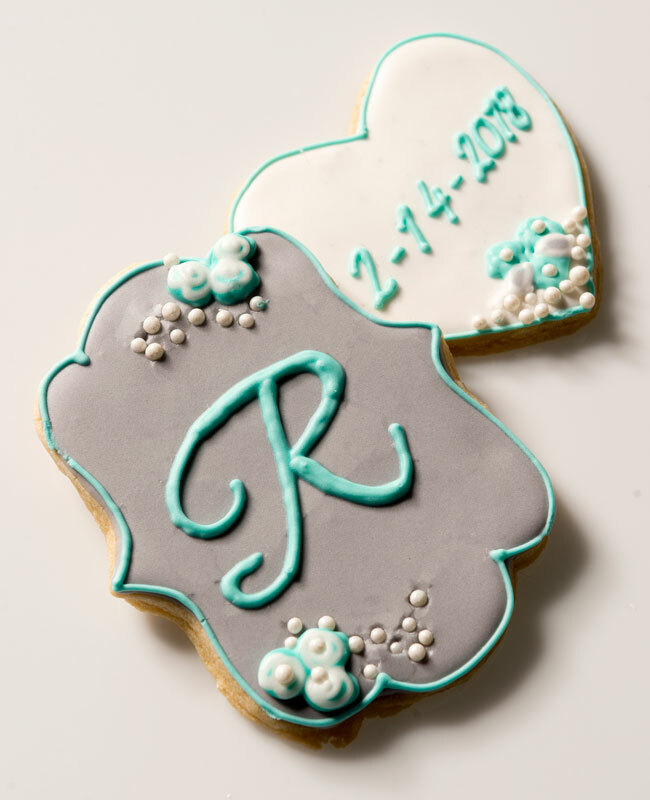 The sugar cookies are frosted with royal icing and are also painted in the same fashion. White paints to please the eye, but the women of The Painted Cake Co. know that real beauty is more than skin – or in this case, fondant – deep. The goal, White says, is for the cakes to be equally visually appealing and pleasing to the palate. “I’m hoping that through all three [of us], what we do best – cakes, painting and cookies – that we’re able to be known for both within the clientele that we speak to,” she says. The pastries are art pieces in their own right, a true creative expression of the artist herself. “It’s like they’re buying this because it’s hanging in a gallery, because they trust my hand with the paintbrush,” she says. And soon, clients might just be able to hang this delicate artwork, White says. “Another thing that is in the works has stemmed from our cookies literally being kept,” she says. “Clients make mention of how they are so pretty they wish they could keep them. So we are moving towards possibly having painted pieces for purchase. Canvas, framed art and even furniture pieces are in the works.” This is a dream come true for any artist. “As a painter I am excited to have other opportunities to keep my brushes busy,” White says. In its short life, the company has already had to expand, contracting with an additional bakery to keep up with orders. Each party has its own job to complete in a timely manner in order to make sure that the pastry puzzle is completed. That challenge is something the company continues to successfully meet, says White. “Timing of receiving, painting and delivering the cookies is super crucial,” she says. We’ve figured out ways to keep our orders more fresh, shortening the time between baking and delivery.” Collaboration has also been key in ensuring the quality of the cakes and cookies match that of the artwork. “I am much more confident in the end result leaving the baking skills in the proper hands and a paintbrush in mine,” White says.